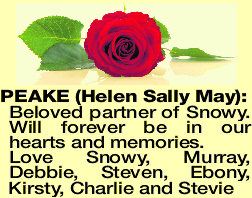 PEAKE HELEN SALLY MAY Beloved partner of Snowy. Will forever be in our hearts and memories. Relatives and Friends of the late Helen Sally May Peake of Geraldton, are respectfully informed that a Service to pay tribute to Sally's life will take place at the Geraldton Crematorium on FRIDAY (29.03.2019) at 12noon. Our beloved Grandmother passed away suddenly in her home in Geraldton and is now resting peacefully with her 3 cherished children. She will be deeply missed by all but forever in our hearts. Our thoughts go out to Snowy at this sad time. Rest in peace Nan. We love you. Your Grand Kids.